Our modular GROB-NET4Industry web applications allow you to network and digitalize your production processes across all plants to make your manufacturing facility even more efficient. From planning to engineering to maintenance, GROB-NET4Industry combines relevant modules for increasing productivity and offers you the all-round package for modern production in the Industry 4.0 era. GROB4Line allows a GROB machine to be connected to the Internet. Consequently, it can be monitored and controlled via a smartphone. Combined with the notification function which sends messages (e.g. machine shutdown, alarm messages or job fi nished) to defined smartphones, the machine operator concerned can respond immediately and minimize unnecessary downtimes. GROB4Analyze determines the machine data with performance indicators and visually prepares these data to maximum effect. The module identifies non-productive phases, allowing the reasons behind weaknesses to be swiftly determined and rectified. GROB4Analyze, then, is a helpful tool for your Continuous Improvement Process (CIP). GROB4Simulate produces an entirely virtual image of the machine, including tool, clamping system, part and NC program. This allows a previously collision-tested and verified NC program to be transferred to the machine. 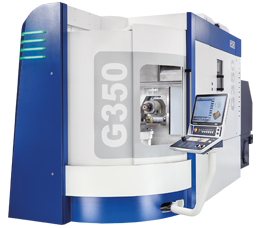 GROB4Coach comprises a programming, simulation and training software solution and not only simplifies the development of part programs on the control-identical software, it also creates the platform for simulating the machining operation. Its training software permits effective, PC-supported CNC training for novices and experts. GROB4Interface is the crucial link for networking the machine with other systems. It provides all information relevant to digitalizing processes and elevating production towards Industry 4.0. The obtained data can be applied for numerous purposes, allowing the user to control production and increase efficiency. GROB4Connect links your machine to the ERP, MES, PLM and TDM system. Via web technology, your production-related data can be transferred straight to the machine operator. The machine operator can enter job feedback, such as tool requirement, into the ERP system directly via the machine control system. Digital and networked production processes – "paperless production"
GROB4Pilot offers the machine operator a modern working environment on the machine through a multi-functional user interface. Paperless production through parallel access to ERP, PLM and MES systems. In addition, CAD/CAM visualizations, simulation viewer and tool management system are supported by the GROB-NET4Industry applications. The entire production process – from the CAD model through to the NC simulation – is digitally mapped on the GROB4Pilot panel. GROB4Automation supplies your machining center with parts on pallets through a fully automated process. The intuitive and simple user interface is operated by keyboard or touch. The production control software controls and visualizes the flexible production cell, thereby facilitating automated, lightly manned production. Storage and retrieval of pallets via "drag & drop"
GROB4Track monitors the state of the machine. Thanks to an automated analysis function, the machine state is known at all times and unscheduled downtimes can be avoided. This allows you to precisely plan preventive maintenance work and initiate spare part orders at the right time. GROB4Care gives you access to the spare parts of your GROB machines. The machines installed in your facility, along with their relevant assemblies and single parts, are included. This allows you to identify the spare parts you need in the form of a parts list structure quickly and reliably and order them around the clock. This is assisted by information on material availability, price and shipping options. Would you like to have access? GROB4Portal permits access to all GROB-NET4Industry products and solutions via one central interface. There is only one login for managing user data, applications and machine data. The intuitive user guidance function is extremely convenient and saves you time and resources.